Whether it is placing a trade, opening an account, building a block trade, or looking for that next trading opportunity, MoneyBlock allows you to do it all online, anytime and anywhere. Some firms focus on specific products; others are consumed with add-on services. We believe that nobody knows your clients better than you and that you should choose those products and services that best meet the needs of your clients. Our web-based platform does not require any special software, hardware, or bandwidth. This gives you and your clients access to some of the most sophisticated tools currently available. In addition, the retail account interface for clients is identical to our administrative interface so you see what your client sees in real time. Need to place a trade online? Whether you execute online or through our Trade Desk, your ticket charges are the same low rate. It’s your business. You’ve built it and you should have the independence to run it your way. MoneyBlock’s hybrid independent broker model empowers each of our independent reps and advisors and lets them choose how they can best service their clients whether through commission-based accounts, fee-based accounts, self-directed accounts, and everything in-between. Customize commission or fee schedules on a per-account basis or across multiple, pre-defined groups. Being independent provides you the opportunity to control your own business and make your own decisions. When you join the MoneyBlock community you enjoy the benefits of being independent plus back-office support of a firm dedicated to helping you achieve your professional goals. With MoneyBlock, you get leading-edge technology, compliance expertise, marketing support and direct access to our senior management team. Products - MoneyBlock has no proprietary products. You chose to be independent so you could make your own decisions. We have a wide range of products available to you and your clients for that exact reason. You or your client have a special product need? Talk to our Rep Support Center to discuss your requirements. 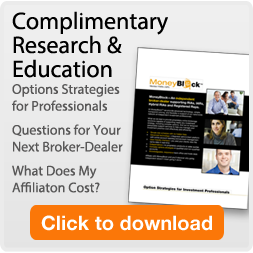 Services - MoneyBlock supports commission-based reps, fee-based advisors, provides custodial services to independent RIAs, and can even support self-directed discount models. Costs - MoneyBlock allows reps and advisors to customize commission and fee structure on an individual account basis, or across an entire group of accounts. Schedules can even be customized based on the product or services provided. MoneyBlock is committed to making your transition seamless and protecting the relationships you have with your clients. We are there to guide you through the process, answer questions, and familiarize you with our tools, resources, and procedures. Protecting the relationships you have built with your clients is our primary objective. That’s why MoneyBlock is committed to making your transition as seamless as possible. Our entire team is there to guide you through the process, answer questions, and familiarize you with our tools, resources, and procedures. We’re dedicated to get your practice up and running as quickly as possible. We know that support goes well beyond your initial transition. We pride ourselves on staying connected and accessible whether through our highly experienced trade desk and back office, dedicated relationship management, or through our accessible executive team. You are never more than a few seconds away from knowledgeable and professional support. Today’s ever-changing regulatory environment can be challenging at times. Let our qualified compliance team help you to comply and stay up to date with current regulations, industry trends, record-keeping requirements, and annual reporting needs. Keeping pace with our ever-changing regulatory environment can be a challenge. Let our well-qualified compliance team help you comply and keep current with the regulations, industry trends, record-keeping requirements, and annual reporting needs that affect your practice. Our industry changes frequently, and so do our rules and regulations. Our qualified staff works proactively to help you stay current with the times and address your compliance needs. Staying ahead of upcoming changes allows you to spend more time servicing your clients and growing your business. Having our own proprietary platform allows us to implement new features and tools based on the needs of our reps and advisors. In fact, many of our most popular tools and features were the direct result of feedback from our reps, advisors, and their clients.